Operating Era: 1925-1973. Modern version era: 1935-1973. Overnight Service Era: 1946-1955. Our newest HO Kit release is the #12800 Series B-50-15, 40 Foot single sheathed box car with steel sheathing, Murphy radial roof and AB brakes for Southern Pacific and subsidiaries. Our One-Piece Body Kit covers series #14480-15229, 750 cars built in 1925 by Standard Steel Car Co. The original single wood sheathed box cars differed from previous SP types in that they used hat section side posts of the 1924 design in a Pratt truss arrangement. In 1935, SP began converting the cars to steel sheathing, first for Pacific Motor Trucking (PMT) service, then for Baggage Express (BX) service in 1942. Freight versions of these cars also began receiving steel sheathing in this period and by the beginning of WWII, 930 cars in freight service had been converted (Total of all B-50-15 built versions was 3900 cars). 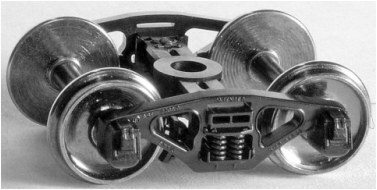 Beginning in 1942, the cars began receiving AB brakes as well. In 1946, SP started a new Overnight freight service and used around 150 B-50-15 box cars, along with some new cars, for this service. Cars were painted black, had white SP lettering and a yellow SP herald and a red, yellow and black arrow herald with "Overnight" in it. Our full color decals accurately reproduce this colorful paint scheme. Our unpainted HO Kits include detail parts appropriate for the B-50-15, including the following details: Improved Cast Urethane One-Piece Body Construction with Fine Details. Urethane Castings of detail parts, including many car specific parts. Detailed Hi-Tech rubber air hoses. Yarmouth Etched Bronze Corner Steps and Carmer uncoupling levers. Proprietary Decals covering all freight versions of the car. Detailed Step by Step Instructions and History Sheets with assembly and finished model photographs. Recommended Trucks: Original: Kadee #511 Bettendorf T Section trucks. Modern: Tahoe Model Works TMW-109 or TMW-209 Barber Lateral Motion Trucks. Tahoe TMW-109 or TMW-209 Barber Lateral Trucks available separately or with Kit (See below). Kadee Couplers are available separately. PLEASE NOTE: ADD-ON 3: Tahoe TMW-209 is not available to order with this Kit. You must order KIT #12882 with Tahoe TMW-209 included.